Peace Frog is a 60 page, digest sized, English language Psychedelic music zine published in Greece by George Markou, who also published the now defunct Gew Gaw magazine. Nothing fancy or glossy here but the CONTENT is first rate, and that's what it's all about. 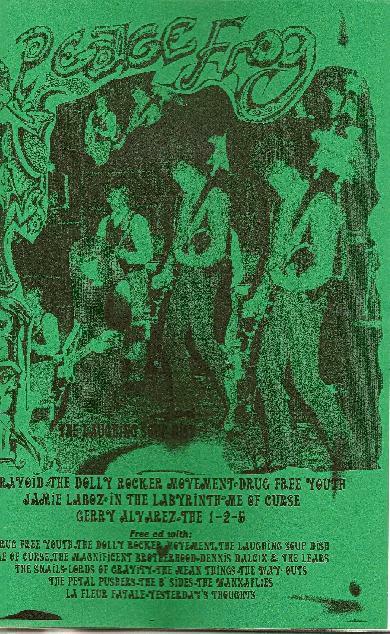 We've got interviews with Vibravoid, Peter Lindhal of In the Labyrinth, Laughing Soup Dish, Gerry Alvarez, The Dolly Rocker Movement, Drug Free Youth, plus some bands I'd not heard of before, including Me of Curse, The 1-2-5, Jamie Laboz, and The Flow. The interviews are detailed and great reads. There's also a bunch of reviews AND a 70 minute compilation CD… 24 tracks, many of which are unreleased. If you like the more garage oriented point on the Psychedelic axis you should check this out. An amazing effort George! Not lots of printed mags of this sort these days so do yourself a favor and snag a copy. For more information you can visit the Peace Frog web site at: http://www.myspace.com/togewgaw.